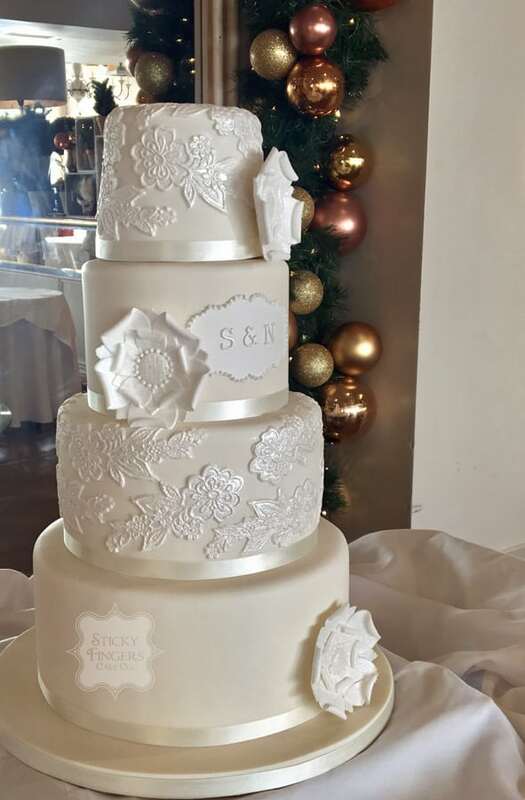 Our final wedding cake of 2017 was for Sue and Nick who were married in a beautiful church service followed by their celebration at the Roslin Beach Hotel in Southend on Sea. Their wedding cake was a traditional 4 tier iced cake based on our “Bella” design but with a twist – they had 3 Tudor Roses attached to the cake. Now I know Tudor Roses are normally red and white (red for the House of Lancaster and white for the House of York) but they didn’t want any colour on the cake so I guess you’d call it “artistic licence”! The yummy flavours they chose were lemon Limoncello, Madagascan vanilla bean, rich, dark chocolate and finally traditional fruitcake. Congratulations! We hope you both had the most amazing day. Finally, thanks again to each and every couple who chose to have a Sticky Fingers Cake Co wedding cake in 2017 – the busiest year yet! Here’s to an even busier 2018!